Week ending 11th January 2019. Despite political impasses in the US and UK, equity markets had another good week, continuing their positive start to the year. Whilst it has been an encouraging start to the year for equity markets, around 800,000 federal workers in the US won’t be so cheerful as they go without pay today (Friday). The US government remains in partial shutdown as Donald Trump refuses to sign off the federal budget unless the government agrees to fund his wall between Mexico and the US. From tomorrow, this will be the longest shutdown in US history and Trump has vowed to keep it going for as long as is necessary. Fortunately, the shutdown is not weighing on equity markets which remain driven by the outlook for US interest rates, company earnings and US-China trade relations. Furthermore, with 47% of voters now blaming Trump for the impasse, and only 33% blaming the Democrats, Trump may soon look for other means to fund his border. Fed chairman, Jay Powell helped lift markets again this week as he stressed there is no pre-set path for interest rates and that the Fed can remain patient and observe how economic data evolves. He also reiterated that data, such as last week’s surge in nonfarm payrolls, is not signalling an economic slowdown and that he doesn’t see the risk of a recession in the near term. 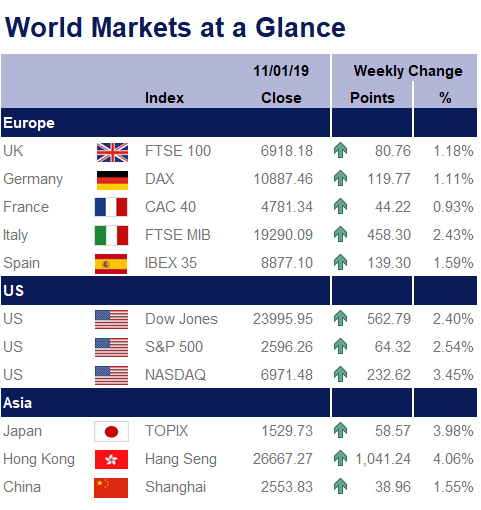 In the UK, equity markets (particularly shares of domestically orientated companies), had a positive week as the government faced defeat on Brexit related amendments, helping reduce the prospect of the UK leaving the EU without a deal. First MPs backed an amendment to the Finance Bill, which limits the scope for tax changes following a no deal Brexit, without Parliament’s “explicit consent”. Second was a provision that if MPs vote against the current EU withdrawal agreement, the government is required to provide details of their next steps to Parliament within three days (previously twenty one). Theresa May has been stepping up efforts to win votes from Labour MPs ahead of next Tuesday’s “rescheduled” vote by promising enhanced guarantees on workers’ rights and the environment. As MPs began five days of debate on Wednesday, rumours were circulating today that cabinet ministers expected next week’s vote to be postponed and the Article 50 deadline will be extended. Whilst Downing Street was quick to play down the rumours, this resulted in another positive day for UK domestic company shares, and also lifted sterling.